Below are some of the library's key policies. Gifts of materials are accepted with the understanding that the library may dispose of them at its discretion. Gifts will be added based on the criteria established in this policy. The library cannot accept gifts with restricted conditions. The library assumes no responsibility for appraisal of gift items. Monetary gifts to support the library should be facilitated through the college’s advancement office. Computing facilities located in the College library are provided primarily for the use of the College’s students, faculty, and staff. Recognizing the library’s mission to serve users beyond the campus, the library permits the use of computer workstations by the general public when not needed by LC students, faculty, or staff. Complaints concerning off-campus users are to be referred to the library staff and, if necessary, to campus security. Complaints about LC students, faculty, or staff are to be referred to the library staff and, if necessary, to the appropriate area vice president. The Library provides five group study rooms on the second floor for collaborative and group learning. Students may reserve a room in advance. Please make a reservation at least 24 hours in advance and cancel any reservations at least 24 hours in advance. Reservations may be made online or at the library information desks (in person or by phone). 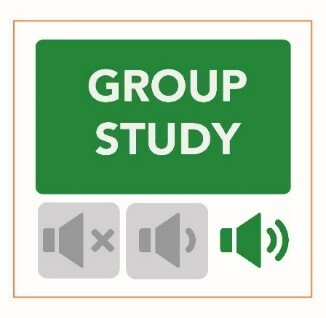 Group study rooms may be reserved up to three hours per day. Reserved rooms that are not occupied within 15 minutes after the reservation will be forfeited and open for use by others. Rooms that have not been previously reserved or reserved rooms which have passed the 15-minute grace period will be available on a first-come, first-served basis. Study room users without reservations must vacate the room when requested by a group with a valid reservation. Rooms cannot be reserved or held by placing personal belongings in them. Unattended items will be removed to the first floor information desk. The Library is not responsible for unattended, lost, stolen, or damaged personal items. Windows and doors should never be covered, blocked, or locked. Windows must remain closed. Users of the group study rooms must leave the room in clean, good condition for the next users, including erasing the white board or chalk board. Dry-erase markers and eraser kits are available for check out at the first floor information desk. Group study rooms are not soundproof. Please be considerate of other library users and maintain reasonable noise levels. To prevent noise from leaving the room, the door should be closed when the room is occupied. In order to provide an atmosphere conducive to study for all library users, the library has established study zones, each of which carries a specific noise level designation. Signage posted near the entrances to library spaces indicates the designated study zone. Those using the library are expected to comply with these designations and may be asked by library staff to relocate to more appropriate areas, if necessary, and/or to comply with the stated expectations below. Group study zones permit conversation conducted at a quiet, courteous level. Loud conversation, shouting, or other behavior that is disruptive to others who may be utilizing the space is not permitted. 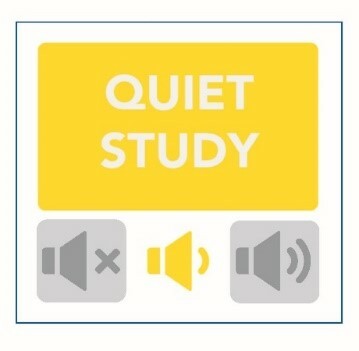 Quiet study zones are available for those who require greater levels of quiet to complete their studies. Brief, whispered conversations are permitted. Cell phones should not be used in these areas and ringers should be set to vibrate or silent. 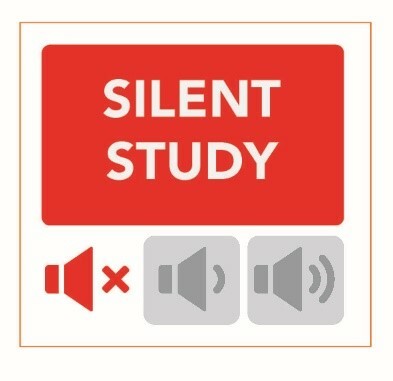 Silent study zones offer noise-free study areas. Conversation is not permitted. Cell phones must be silenced completely. No food is permitted in these areas, as the noise created from packaging can be disruptive to others.